I spend an inordinate amount of time mad at myself because I start projects and then realize I have to finish them. I wrote about Napa (The Town) and Napa Valley (The Middle), and promised I would eventually finish the whole Napa thing…and although I have since been distracted by just about everything… it’s closure time. Therefore… Napa Valley, Part Three… Up There (Part One). 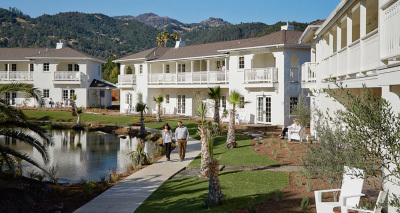 So as promised… let’s move north to St. Helena and Calistoga. One other note… there are a zillion great hotels, inns, restaurants and winery venues throughout the Valley that I have not talked about. Go visit them. Previously known as Greystone Cellars, with grand cathedral ceilings and massive hand-cut stone walls, it is now brimming (that is my word and although I don’t know if it really fits, it sounds good anyway) with teaching kitchens and demonstration theaters, perfect for team-building (and eating and drinking). Same goes for private lunches/dinners. In addition, they have a new location in downtown Napa, the CIA at Copia. I did not write about it in my previous downtown Napa blog… but now you know. (As an aside I have always wondered about how one measures outdoor event space since… I mean… the outdoors is pretty big and all I really want to know is how much indoor, use-able meeting space there is. For some reason, it often seems an elusive figure for many hotels. I mean… if I was king of the world…just saying).